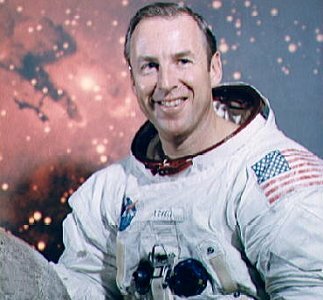 James Lovell is a retired American astronaut who became the first human to go into space four times, flying aboard Gemini 7, Gemini 12, Apollo 8, and Apollo 13, and the only person ever to go to the Moon twice and not land. Lovell attended the University of Wisconsin for two years, then entered the Naval Academy at Annapolis, graduating with a B.S. in 1952. Following graduation, Lovell received flight training and served at a number of navy bases until entering Naval Test Pilot School in 1958. One of nine NASA astronauts chosen in September 1962, he was first assigned as backup pilot for Gemini 4. In January 1966, after returning from Gemini 7, he was named backup commander for Gemini 10, a job generally thought to be a dead end. Under the NASA rotation system, Lovell could have expected to command Gemini 13, but the program ended with flight number 12. His continued involvement with Gemini would keep him from being named to the early Apollo flights. But on February 28, 1966, Gemini 9 astronauts Elliott See and Charles Bassett were killed in a plane crash. In the subsequent shuffle of crew assignments, Lovell and his pilot Buzz Aldrin moved from the Gemini 10 backup to Gemini 9, and were later assigned to Gemini 12. A year after Gemini 12, in the wake of the tragic Apollo 1 fire, Lovell was assigned with Neil Armstrong and Aldrin to the backup crew for what eventually became Apollo 8. In July 1968 Lovell was promoted to prime crew, replacing Michael Collins. This sequence of events made it possible for Lovell to become one of the first humans to fly around the Moon, but cost him his participation in the first lunar landing. A similar mix of good and bad luck placed Lovell on Apollo 13. As backup commander of Apollo 11 he was in line to command Apollo 14. But an attempt by flight crew chief Deke Slayton to name Mercury astronaut Alan Shepard, recently returned to flight status, to Apollo 13, was blocked by NASA management, who thought Shepard needed more training. In August 1969 Lovell was asked if he and his crew could be ready in time to fly Apollo 13, eight months later. Lovell said they could and got the job. Following Apollo 13 and a leave to attend Harvard, Lovell was named deputy director for science and applications at the Johnson Space Center in May 1971. On Mar. 1, 1973, he retired from the Navy as a captain and resigned from NASA to enter private business. Lovell's book (written with Jeffrey Kluger) about the Apollo 13 mission, Lost Moon: The Perilous Voyage of Apollo 13, became the basis for the Ron Howard movie Apollo 13. In the film, Tom Hanks plays Lovell but Lovell himself makes a cameo appearance as the captain of the USS Iwo Jima, the naval vessel that led the operation to recover the Apollo 13 astronauts after their successful splashdown. Lovell can be seen as the naval officer shaking Hanks' hand.